How can working with a job search/career coach help me? Each job seeker has a unique and individual background and immediate and future career goals. Working with a job search/career coach allows the job seeker to obtain personalized advice specific to their situation. General career advice can only get you so far. My job is to help you identify your strengths and interests and how to best package and demonstrate them to land your next fulfilling role. You will also have a coach helping you set goals and timelines and remain on task so you can get to your desired destination as soon as possible. Having scheduled coaching sessions creates accountability and can help with overcoming procrastination. You are also getting real-time feedback to improve elements of your job search strategy. What does your job search coaching package contain? Often job seekers think that a well-written resume is the key to an effective job search. Although a resume is an essential tool, it is just one element of a comprehensive job search strategy. My package addresses all facets of your job search plan and it goes far beyond your resume document. Although writing, editing or rewriting your resume is part of the package, I coach job seekers on the crucial and essential skills of effective and targeted research, networking, personal branding, interviewing, follow-up and negotiation skills. Simply contact me and we will have a complimentary 30-minute call to understand your goals and objectives. From there I will create a custom-tailored plan to meet your needs and personal goals. Yes! I conduct job search workshops where I cover a number of job search topics. Attendees will leave with actionable tactics that can be implemented immediately. If you’re interested in hosting a speaking engagement for your organization, association or group, please contact me. I am interested in purchasing a coaching package for a friend, family member or colleague. Do you offer gift certificates? Yes! 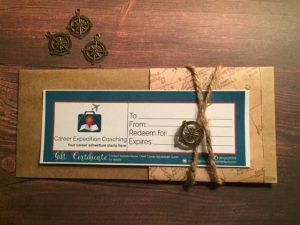 You can buy a gift certificate that can be redeemed for a coaching package. A gift certificate is a perfect gift for recent college graduates, colleagues that are stuck and you want to help them find better or anyone needing specific and personalized job search coaching guidance. Each gift certificate is cleverly packaged and ready for gift giving. CLICK ON GIFT CERTIFICATE IMAGE TO ENLARGE.